Fashion that fits your life and your need for originality--that's what you get with each of these plus-size, feminine designs to knit. Enjoy a softly textured sweater with fun, oversized buttons. A coral hue enlivens a collared pullover that goes well with skirt or pants. Looking for an outfit that goes from office to opera? Treat yourself to a rich twin set, a cardigan that complements your curves, or the relaxed fit of our elegant wrap. 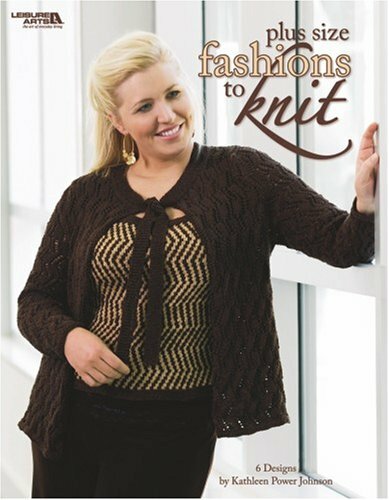 6 plus-size fashions by Kathleen Power Johnson to knit in medium, bulky, or super bulky weight yarns: Red Wrap, Tweed Jacket, Cabled Pullover, Asymmetrical Cardigan, and Brown Twin Set with Camisole and Cardigan.